lowest since Gallup started tracking this question a quarter of a century ago. 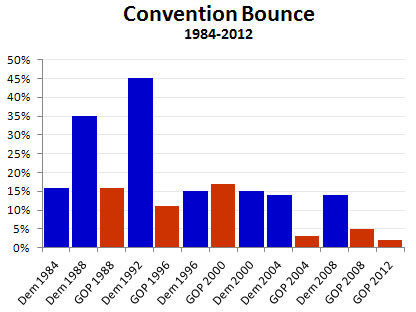 The chart on the right shows the net bounce for most conventions going back to 1984. What I found most interesting is that aside from two outliers with gigantic bounces, every convention has produced a bounce of about 15 percentage points. Every convention, that is, until you get to Republican conventions in the Bush era and beyond. Ever since W stamped his imprint on the GOP, their convention bounces have been nearly invisible. Apparently, putting themselves on display to the American public simply doesn’t make a positive impression anymore. Those of us who are liberal hacks will have an obvious reaction: No kidding. Is it any wonder that the American public doesn’t get the warm and fuzzies from watching the parade of rabid true believers that make up today’s GOP? Still, it’s kind of curious, isn’t it? In other news, Gallup reports that Romney’s acceptance speech was the most poorly received of any speech since they started keeping track in 1996. In fact, it wasn’t even close. The net positive rating for Romney was nine points lower than the previous worst speaker (John McCain) and a full 13 points lower than the pre-Romney average. Ouch.